This Remodeling Project involved the updating of this 40 year old Kitchen while staying within the existing walls creating one of the more difficult and demanding renovation challenges. Originally built and designed for the “60’s”, the Client requested that the design allow her and guests more room and to be able to interact during food preparation without physically interrupting the process. The Kitchen needed a complete redesign and make over but staying within the budget for this modest ranch home. Upon entering the kitchen from the foyer, the refrigerator greeted you and partially blocked the entrance way. While seated at the dinette area, one getting up would run into the peninsula or be blocked by the chef at the cooktop. The existing kitchen needed a fresh new design appeal to allow a more spacious look, an entertainment friendly function, and to meet the Homeowner’s cooking needs. The challenge was to create all this within a moderately small space while allowing multiple passage access to the living room, foyer and back hallway. It was desired to allow more natural light into the room, however, available exterior window space opportunities were at a minimum. The existing kitchen was beset with poor features for the chef and circuitous path. The design approach had to incorporate a user friendly kitchen and simultaneously serve as the dramatic centerpiece of a spacious and functional floor plan concept while being limited within the existing space. The existing kitchen was demolished including the peninsula, all cabinetry including above the peninsula and all soffits. This allowed for a new open space within which to redesign the work space and created an aesthetically pleasing Kitchen. Extra space was added by custom building the cabinetry to create additional work spaces which was critical. Cabinetry, counters, and appliances were redefined to create the new kitchen as the focal point allowing the freedom of the custom cabinetry to flow with staggered depths to create an architectural feature with the crown mouldings. Easy access to pots, pans, spices and utensils is now organized in such a manner so that now everything is in its place and the natural beauty of the granite surfaces are displayed uncluttered. The refrigerator was relocated away from the foyer entrance doorway and relocated in the space in which the doorway to the Living Room existed. The old refrigerator area is now replaced with custom china cabinetry with staggered depths to allow the much desired room for entering and actually become part of the dinette. 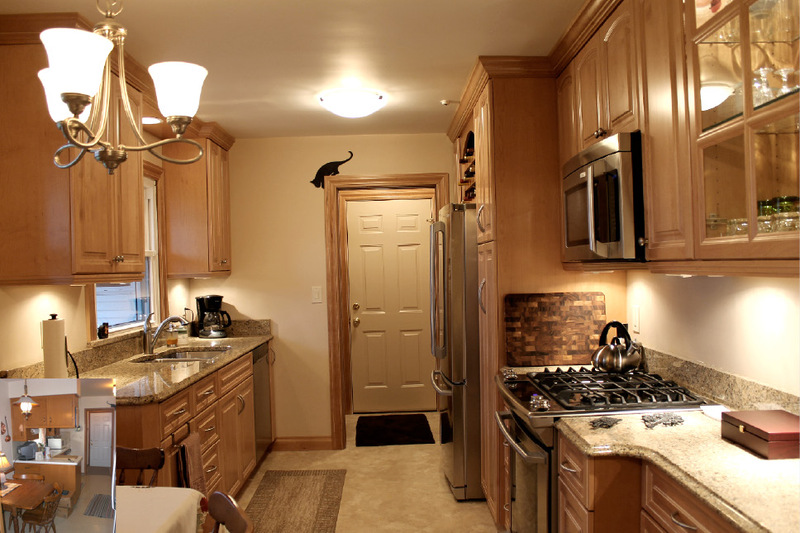 The cooking area was relocated with a vented above-the-range microwave which freed the counter space of the microwave. All convenience appliances are housed with their own power source, allowing quick and easy use by the chef. Additional natural light was achieved by introducing new elements like the cabinetry picture framing the kitchen window. Indirect and direct artificial lighting was added throughout utilizing task lighting for the extended work space and the elegant glass cabinetry door display.